In the 1930s, in little Tel Aviv surrounded by sand dunes, the Israel Philharmonic Orchestra gave its first concert. The orchestra was founded by the famous violinist Bronislaw Huberman and its members were Jewish musicians who had been thrown out of orchestras in Germany when the Nazis came to power. 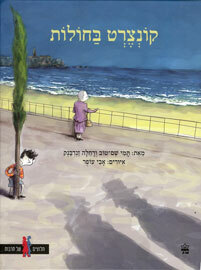 This moving event is told as a mystery story by Uri, a little boy. Uri’s grandmother, who speaks German, invites him to go for a walk through the city, and to follow some people dressed in black suits and carrying oddly shaped suitcases. “Does Grandma like playing spies?” Uri wonders. Then he sees that more and more people are following the group with strange suitcases, and even construction workers come down from their scaffolding to join the procession. One of the men in black, who looks important, speaks to Uri’s grandmother in German: he knew her back in Europe. “Good luck, Mr. Huberman!” people say to him. In the end they all come to a large hall. Then the men in black open their cases and take out various instruments, and a man waving a little stick gets up on the stage. He is the conductor, Arturo Toscanini. Uri listens to the magical music. The sounds touch his heart. And when he looks at his grandmother, he sees tears of excitement in her eyes.